It was mentioned in today's FH that Leon Russell was a member of the house band on the weekly tv show " Shindig", that band being a group called the Shindogs. I don't know how many records that the Shindogs put out but the only one they made that charted here in OKC was the song WHO DO YOU THINK YOU ARE on Viva Records in 1966. It does say on the record that Leon Russell produced it. I believe this record charted nationally as well. "Who Do You Think You Are" was The Shindogs' only charted hit. It peaked at #91 in 1966. Leon had QUITE the illustrious career ... everything from Shindig to The Wrecking Crew, to major concert events like the Mad Dogs And Englishmen tour and The Concert For Bangla Desh ... to a few solo hits of his own to stand beside some of the excellent, timeless music he wrote that was recorded by others. Thanks again to Steve Sarley for his excellent tribute piece. Your feature concerning Leon Russell was nothing short of excellent and first-rate. It reminded me of a YouTube video I had watched that I really thought captured the essence of his lifetime works and the friendships and respect he had garnered over his lengthy career. I am sure Leon Russell is very complimented and playing a rousing encore of "Cry Me A River" with Joe Cocker and some of his Mad Dogs & Englishmen." Reading the Condolences and Compliments from his legendary fellow-musicians was really superb. Again Kent, thank-you for a truly fine tribute to one of America's finest musicians. Just following up on my request for images of KRLA and KJR (Seattle) charts from the summer of 1967 that list Beatles songs from Sgt. Pepper. This would be for June, July and possibly August of 1967. I know that KRLA had “A Day In The Life” at number 2 behind the Doors “Light My Fire” for two weeks in July 1967, based on the one chart image (low rez) I came across. Hopefully someone out there in your circle has some charts. Please let me know if any of your followers that specialize in local radio charts have any of these charts. Or you can put me in touch with them if that is easier. As always, your assistance is appreciated. P.S. Unfortunately KRLA Beat magazine stopped including the KRLA Top 40 charts around May 1967, so I cannot get the information and images that way. We ran this request a few weeks back and never got a response from anyone ... I even did a bit of searching on my own but couldn't come up with anything online. FH Reader Bob Merlis just sent us this awesome piece on The O'Jays ... so we just had to share. 2017 marks the 45th anniversary of the release of two of The O’Jays best known, most enduring hits, the themes of which are a reflection of humankind’s continuing conflict between good and evil, love and hate. The recordings of “Back Stabbers” and “Love Train” coincided with the legendary group’s signing to Philadelphia International Records and the start of a relationship with the production team of Gamble and Huff. “Back Stabbers,” in fact, went all the way to #1 on Billboard’s R&B chart and to #3 on the Hot 100 (pop) while “Love Train” went to #1 on both the R&B and Hot 100. The group’s accomplishments, in terms of chart and sales achievements, include the fact that they’ve gone on to have 15 RIAA-certified Gold or Platinum records. Their resume includes 6 Top 10 Pop Singles and 3 Top 10 Pop Albums. Their presence on the R&B charts is even more resonant and includes 7 #1 R&B singles among their 24 Top 20 R&B hits. Four of their releases went to #1 on the R&B album chart that has hosted 15 O’Jays albums in the Top 10. Last year, they celebrated the 50th anniversary of “Lipstick Traces (On A Cigarette),” their first significant chart breakthrough, which climbed halfway up the pop charts in 1965 and next year will mark the 50th anniversary of “I’ll Be Sweeter Tomorrow (Than I was Today)” which was the first of their top 10 status on the R&B Chart singles. The O’Jays are more than the sum of their chart achievements but, rather, a reflection of a lifetime of dedication, artistic excellence and friendship. The group, in fact, dates back many years before the time of their great commercial success. The first record credited to The O’Jays to appear on the Billboard chart was “Lonely Drifter,” charting in September, 1963, on the very same day that “She Loves You” by the Beatles was released. The group actually started recording for King Records (as the Mascots) in 1961, the year John F. Kennedy was inaugurated. They trace their origin to that day, almost 60 years ago, when the group first got together while attending Canton, Ohio’s McKinley High School. The two founding and continuing members, Eddie Levert and Walter Williams actually first met when they were 7 and 6 years old, respectively, and recently took time to reflect on the path they’ve taken to international stardom for the better part of seven decades. With numerous career milestones to their credit, the O’Jays continue to perform and spread their message of love and hope. They are a constant reflection of the indomitability of the human spirit. I really enjoyed the Micky Dolenz cd review -- and I agree 200%! I loved your Petula Clark hits list you posted today. Looks like she covered a lot of songs back in the fifties that were hits here in the USA by other artists. I did happen to notice one you didn't list. It made our local survey, though briefly. Are you familiar with her 1963 song THE ROAD on Laurie Records? I went online and apparently it got some airplay in various markets here in the country but not enough to generate sells nationally. Expect a mix of new songs and fresh takes on some past classics. Tommy James says working on his upcoming album is "a great experience." The rock veteran known for "Crimson and Clover" and "Mony Mony" says it's the first time in his career that he can experiment without record company people breathing down his neck to finish an album on deadline. He expects the still-untitled project to out at the beginning of 2017. It will a combination of new songs and fresh arrangements on past classics. A standout is a new version of "Draggin' the Line" with guests Steve van Zandt and rapper Tone-Z. night on many PBS stations. We're supposed to get an exclusive "sneak peek" of one of Tommy's new tracks ... just waiting for the go-ahead to run it. Can't wait to hear the whole CD! Lou Christie sent us a list of upcoming shows ... hopefully some of our readers will get a chance to check these out ... ALWAYS a great time in concert! Here's a list of some of my upcoming concert appearances. I'll be crisscrossing the country in the next couple of months and I hope you'll be able to stop by! Be sure to visit my new website, "Lou Christie says, It Should Have Been A Hit" and listen to favorite records that I think should have been a hit but, for whatever reason, never made it to the Top Ten Charts. Hear my comments, listen for yourself, and vote on whether you think the song should have been a hit. You can go back and listen to my earlier selections as well. There is a new songs every few weeks. My next selection will go up after Thanksgiving and will usher in the Holiday Season! Yes, there's been quite a bit of buzz about this these past few weeks. Not sure exactly what it means, however. THIS GUY WAS HUGE ... GREAT, UNDERATED GUITAR PLAYER FROM NEW JERSEY! Al Caiola, a guitar virtuoso who recorded with music legends since the 1950s — and who performed at the Glen Rock Inn into his tenth decade — died last Wednesday at a nursing home in Allendale. Mr. Caiola, formerly of Oradell, was 96. The guitarist had hits of his own. His version of the iconic theme song from TV’s “Bonanza” reached No. 19 on the Billboard chart in 1961. The same year, his version of the theme from the classic movie western “The Magnificent Seven” topped out at No. 35. Tony Motolla, editor of Jersey Jazz, the journal of the New Jersey Jazz Society, said versatility was truly the key to Mr. Caiola’s prolific career. “He had the ability to play all different styles on demand and was a great sight reader,” said Motolla, whose late father, also named Tony Motolla, had a guitar career that paralleled Mr. Caiola’s. Alexander Caiola, a barber’s son from Jersey City, led Marine bands stateside and saw combat in World War II’s Battle of Iwo Jima. He joined the CBS Orchestra in 1946, working on shows hosted by Ed Sullivan, Arthur Godfrey, Jackie Gleason and Steve Allen, broadcasting pioneers all. He stayed at the network for a decade before striking out on his own. He worked constantly. In the 2009 book “Conversations with Great Jazz and Studio Guitarists,” Mr. Caiola reflected on the great vocalists with whom he shared a studio. A late-night session with a young Barbra Streisand stuck in his memory. For a studio musician at the pinnacle, Mr. Caiola was modest to a fault. “He never boasted — that wasn’t the kind of person he was. He was just like everyone else,” said Arlene Rosenberg, whose Elmwood Park agency, Shelly Productions, booked Mr. Caioli’s gigs at the Glen Rock Inn. Mr. Caioli typically performed as a duo with the bassist Jerry Bruno. Several years ago, Mr. Caiola joined two contemporaries, Pallo and Bucky Pizzarelli, and two younger musicians, Frank Vignola and Gary Mazzaroppi, as the Jersey Guitar Mafia. They cut a CD and performed regionally. Mr. Caiola is survived by his wife of 69 years, Rosalie; two children, Alexander Caiola Jr. and Sandra Ayres; four grandchildren and four great-grandchildren. Arrangements were by William G. Basralian Funeral Home, Oradell. HO! HO! HO! ~ LET THE HOLIDAZE BEGIN! Yes, it's THAT TIME AGAIN! "Everybody's Happy 'Cause It's Christmas Time" ... Now Radio Ready for your Holiday playlist. Just catching up with the blog, something I don't have time for every day sadly, and got around to your reply to my first message on this new online station for Chicago's Me-TV-FM. I asked long-time Forgotten Hits Reader Steve Sarley to say a few words about Leon Russell for our readers. Steve is, without question, the biggest Leon fan I know and followed his career closely for years. I, too, was a fan of his music and the way he always made his own personal performance and personality stand out regardless of which artist he may have been working with at the time. My three favorite bands / musicians of all time are Little Feat, the Band and Leon Russell. Lowell George, the founder and leader of the Feats died of a drug-related heart attack in 1979. The Band’s incredible backbone, Levon Helm, passed away after a long battle with cancer in 2012. Well, this past Sunday was the day the music died for me as I learned that Leon Russell, “The Master of Space and Time” passed away in his sleep at age 74. Russell had been battling various physical problems in recent years including brain surgery and heart surgery. He was recuperating at home, preparing to go back out on the road the first of next year when his wife found him dead in bed. It was the perfect way for Leon to draw his last breath. Leon wasn’t one to make a flamboyant exit and he never seemed to need to hear the calls and screams for an encore. His death was similar to his performance life. He just slipped off the stage. Born Claude Russell Bridges in Lawton Oklahoma, Leon took up the piano at the age of four and started playing professionally in bar bands at the age of fourteen. He recorded 31 albums in his career and I dare to say that Leon rivaled James Brown for the true title of “the hardest working man in show business.” The man toured constantly for 60 years and was still doing 200 shows a year up until his latest illness. I discovered Leon Russell by accident. I remember picking up an album in downtown Chicago at Rose Records. It was titled “Look Inside the Asylum Choir.” I don’t have any idea why I purchased an album with a picture of a roll of toilet paper on the cover. Inside I found an amazing collection of songs written and performed by Leon Russell and Marc Benno. Russell’s voice, I must admit is an acquired taste. I found that I immediately acquired it. I loved Russell’s piano playing style and screechy, gravelly voice. I loved his lyrics. Throughout his career he wrote about love and peace and God and being good to your fellow man. Leon Russell had a beautiful soul. Listening and watching Russell’s piano playing, it is hard to believe that a childhood illness robbed him of some of the use of his right hand. Leon wrote in a way that he was able to cover up his physical shortcoming by relying more heavily on his left hand. Leon was quirky guy. He eschewed interviews and would only agree to them if he could receive the questions via fax and send them back the same way. After concerts, he’d autograph merchandise but would not make contact with his fans. You’d buy your t-shirt or whatever and you’d hand it to his son, Teddy Jack, who would carry it to the back of the tour bus where Leon sat in the dark with pen in hand. Teddy Jack would then bring the signed item back to you. I will definitely claim that Leon Russell’s resume is the best in the history of modern popular music. He played with everyone, he wrote many hits for himself and others. He played on or produced more records than anyone I can think of. He was a member of the Wrecking Crew, that legendary assemblage of the greatest studio musicians in the world. Many Leon Russell compositions became hits for other performers. “A Song for You” has been recorded by over 40 performers. B.B. King had a huge hit with “Hummingbird. Joe Cocker’s signature song was “Delta Lady.” “Superstar” was a mega-hit for the Carpenters. “Blues Power” is an Eric Clapton standard. George Benson won "Record of the Year" for Leon’s "This Masquerade", which became the first song in music history to hit #1 on the jazz, pop and R&B charts. He even wrote “Everybody Loves a Clown" and "She's Just My Style" for Gary Lewis and the Playboys. The Rolling Stones’ hit “Shine a Light,” which became the title for their concert movie was actually a Russell song called “Get a Line on You” that was re-written by Mick Jagger and Keith Richards. Who did Leon play with or produce for? -Jan and Dean, Gary Lewis and the Playboys, George Harrison, Delaney and Bonnie, Edgar Winter, Dean Martin, Freddy Cannon, Ringo Starr, Doris Day, Elton John, Bruce Hornsby, the Zac Brown Band, David Gates and Bread, Bill Wyman, Jesse Ed Davis, Rita Coolidge, Gram Parsons, Barbra Streisand, Ricky Nelson, Aretha Franklin, Ann-Margret, Marvin Gaye, Steve Winwood, The Monkees, The Ventures, The Beach Boys, The Rolling Stones, The Crystals, The Nitty Gritty Dirt Band, The Everly Brothers, The Righteous Brothers, John Lennon, Eric Clapton, Barbra Streisand, the Beach Boys, the Ventures, Willie Nelson, Badfinger, the Tedeschi - Trucks band, Herb Alpert and the Tijuana Brass, Frank Sinatra, The Band, Bob Dylan, the Gap Band, the New Grass Revival, J. J. Cale, B.B. King, Dave Mason, Glen Campbell, Joe Cocker, the Rolling Stones, Phil Spector, the Ronettes, the Crystals, Darlene Love, Brian Hyland, Ike and Tina Turner, Badfinger and the Flying Burrito Brothers. He even had a short stint replacing Paul Revere in Paul Revere & the Raiders when Paul was called to fulfill a military obligation. Leon was a “Shindog” a member of the house band on the “Shindig” television program. 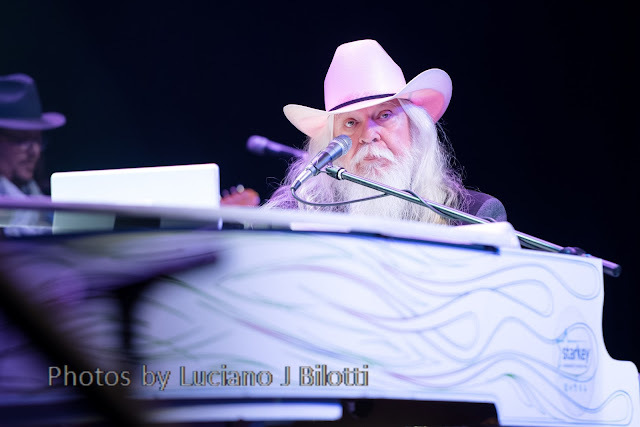 Leon Russell was unique in appearance with his exceptionally long brown hair and top hat, which changed to snow white and cowboy hat over the years. He wasn’t a dancer or a histrionic performer, he basically sat and banged the keys of his piano but you always knew who the star of the show was. In fact, in 1973, Billboard Magazine listed Russell as the top concert attraction in the world. He put together Joe Cocker’s legendary Mad Dogs and Englishman extravaganza tour. He was a driving force behind the Concert for Bangladesh. Both events were made into Hollywood movies. Watch them and you’ll realize the star power of Leon Russell. Two Leon Russell urban legends that can be debunked are that he played on Bobby “Boris” Pickett’s Monster Mash. Leon did not. He was supposed to but arrived late for the session and another player took over the piano bench. Leon also was not Mr. Green Jeans on the Captain Kangaroo show, a tale which is often circulated. 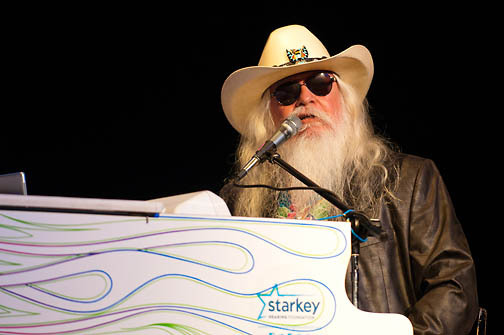 Leon Russell had a splash of notoriety in 2010 when he was asked to co-write and record an album with a long-time admirer, Elton John. The album was a hit. What did Leon do with the windfall he collected from the album sales? He went out and bought a new tour bus, of course. 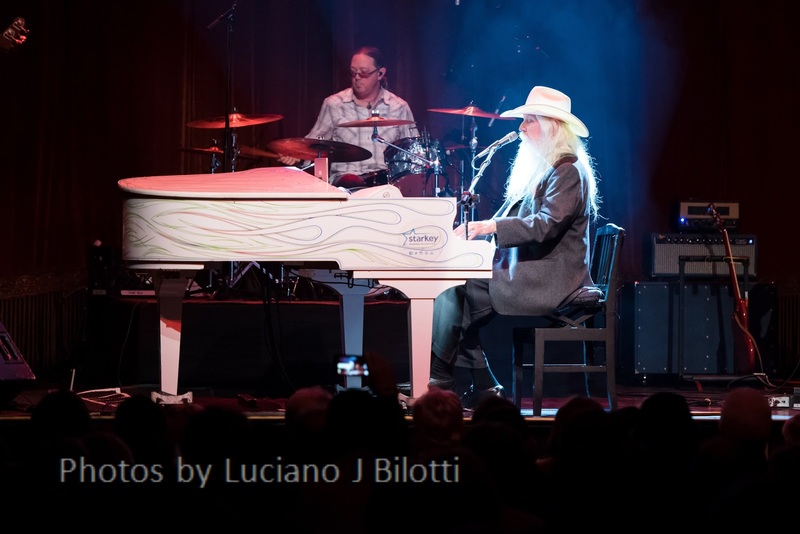 I am glad to say that I was fortunate to attend Leon Russell’s October 2015 concert at the Arcada Theater in St. Charles. I was honored to be able to write a review of it for Kent Kotal’s Forgotten Hits blogsite. Leon performed with a new energy that I don’t’ believe he had exhibited in a while. He told incredible stories and showed himself to be the consummate entertainer. I was looking forward to his spring 2017 shows at Chicago’s City Winery after his recovery. Of course, that performance will not occur. My heart is heavy. Goodbye, Leon. I’ll miss you dearly. Brian Wilson: So sad to hear about Leon's passing. He was a wonderful music-maker and I will miss him. Al Jardine: I am so sorry that Leon has passed. He was so important to Beach Boys music and to all music everywhere, Tight Rope and This Masquerade. He was an incredible person to be with, damn it....Rest in peace, Leon, and thank you for all of your great music. Sheryl Crow: So long, Leon Russelll. You played your heart out and we will miss you. Thank you for sharing your divine talent with us. Brian May: R.I.P. LEON RUSSELL, Songwriter and Musician dies at 74. Responsible for so many wonderful, familiar songs. Check out his work. Another great talent lost in 2016. 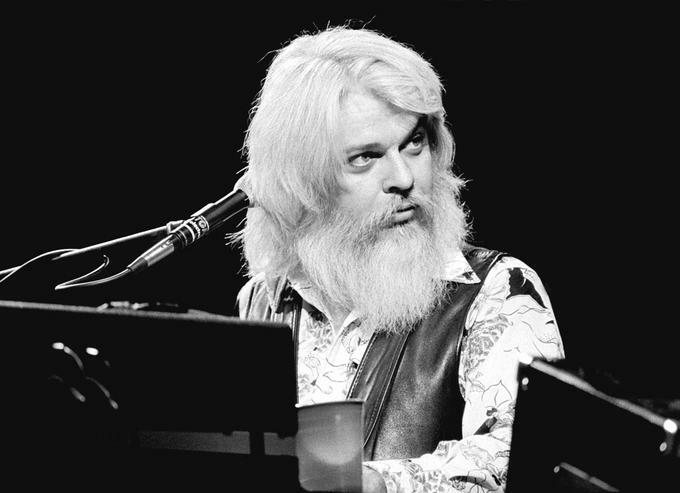 Jimmy Webb: Sad to hear of the passing of fellow Okie, Leon Russell, a talented singer, songwriter and performer. Perhaps he's reuniting with Joe Cocker for another "Mad Dogs And Englishmen" tour. Yusuf / Cat Stevens: So sad to hear Leon Russell has passed away. A great influence and songwriter. God rest his soul. Booker T. Jones: RIP my friend of 50 years, generous trail blazer, Leon Russell, who rescued me and remained a gentleman throughout Hollywood's trials. Charlie Daniels: Just got word that Leon Russell has passed away. Rest in peace, Leon ... You left a lot of great music behind you. The Doobie Brothers: Another great loss in the music world ... Leon Russell was an incredible singer / songwriter / musician who wrote some of our favorites such as 'A Song for You' and 'Delta Lady.' We had the privilege of crossing paths with him during our career and most recently shared the stage with him in 2011. What an incredible talent to lose." Bruce Hornsby: Leon Russell (along with Elton John and later Keith Jarrett) was the inspiration that made me interested in and then consumed with playing piano and writing songs. He was completely unique, a deep soulful presence who had a groove and feel on the piano that was unmatched. He always wanted to write standards, songs that would become part of the Great American Songbook, and he did just that, writing such songs as "A Song For You" and "This Masquerade" that will be sung forever. But my favorite Leon was the wide open, incredibly joyous gospel-charged rockers that made his concerts so transformative and amazing. I thought I had a pretty solid Leon imitation on the piano until I started working and hanging with him. Watching what he did up close was eye-opening, way deeper and more complex than what I'd been doing. He schooled me in old gospel piano traditions, like the COGIC (Church Of God In Christ) style from which he had drawn so much. To hang out with Leon was to always emerge with a classic vignette, a memorable turn of phrase, a funny or amazing old story; he was a walking trove of information, inspiration and humorous anecdotes. This may be the part of him I'll miss the most. But the music, of course, will live on, and I will always reference Shelter People, Leon and the New Grass Revival, Asylum Choir records for inspiration and pure enjoyment. Like a great many lifelong fans and friends, I'll miss him forever. Darlene Love: We lost one of the greatest piano players of all time! Leon & I got inducted into the R&R HALL OF FAME at the same time. He played on most of all the early Phil Spector sessions. He was a dear friend. Even played piano at my fathers church. RIP my dear friend! Sean Lennon: Leon Russell R.I.P. One of my biggest music and style icons. Seems like many of the greatest musicians are leaving the planet this year. There must be some kind of cosmic party in space happening we don't know about. This planet will never be the same. Olivia & Dhani Harrison: We lost another friend. Ringo Starr: God bless Leon Russell. Peace and love to all his family. Chaka Khan: Goodbye to yet another prolific, iconic artist, Leon Russell. George Benson, the late Ray Charles and I covered one of his most memorable tunes at the 1991 Montreux Jazz Festival. Steve Lukather: RIP Leon Russell. Truly one of the greats. David Paich: RIP Leon. Thank you for a lifetime of coolness and inspiration. Steve Martin: Read the obit, then listen to his masterpiece, Song for You. 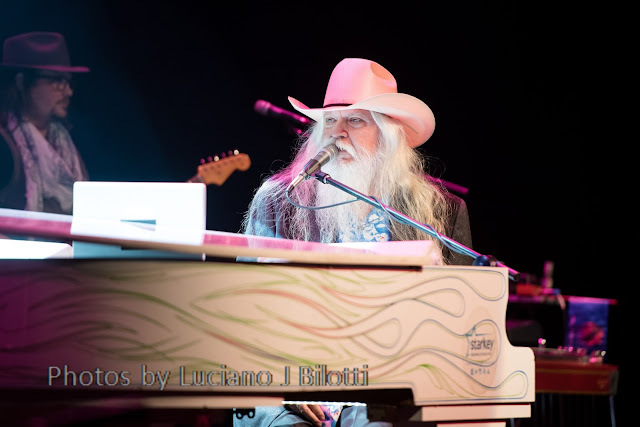 Leon Russell, Renowned Songwriter and Musician. William "Bootsy" Collins: Another rock hard legend has changed frequencies, Mr. Leon Russell. Send out yr prayer's & love vibes to his family & friends! R.I.P. Brother. Martha Quinn of MTV: My older brother's copy of Concert For Bangladesh introduced me to Leon Russell. After George Harrison announced, "Coupla numbers from Leon..." what jumped out of the grooves was an onslaught of funk and and boogie so awesome there was no doubt why the other musicians onstage, including Eric Clapton and Bob Dylan, were so reverent. Known as "The Master of Space and Time" Leon passed away in his sleep early this morning at his home in Nashville, he was 74 years old. Rest In Peace, Leon Russell. Chris Robinson: The master of space & time has left the planet. Long live the man under the top hat! Truly one of our biggest influences & a real American music legend! We love you Leon! Keith Allison: Leon and I played on many recording sessions together in the 60's & 70's. Leon played on my first album I recorded as a solo artist. I loved his unique gospel, and rock style. He blazed the trail for all the great musicians from Tulsa who followed him to LA. PEACE AND LOVE, SWEET LEON. Bobby Hart: Just heard the heartbreaking news that legendary Leon Russell (74) and friend has passed; our loving thoughts and prayers are with his family and loved ones during their time of grief; the world has lost another great talent. R.I.P. Leon. Air Supply: A great loss to the music world. A legend has left us. Rest is peace Leon Russell. Tedeschi Trucks Band: Farewell friend. It was an honor to watch you work Leon Russell. Dave Mason: I first got to know Leon through my association with Delaney and Bonnie, and his wonderful piano style, which he used so effectively on ‘Look At You, Look At Me’ and ‘Shouldn’t Have Took More Than You Gave’ on my first solo album, Alone Together. I have done many shows with him over the years, and was fortunate to have played with him at Lockin Fest with the Tedeschi-Trucks salute to Mad Dogs and Englishmen. He will be missed. Gregg Allman: You will be missed friend. Paul Stanley: A brilliant songwriter, pianist and bandleader. Too many moments of greatness to list. Gary Lewis: Leon Russell and producer Snuff Garrett were the guiding forces of my entire career. Snuffy knew exactly how to pick hit songs, and Leon as an arranger knew how to do everything else, and played different instruments on everything we did ... He was a great talent. An incredible tribute to Leon. I do not want to be the guy who writes obituaries. Especially of faded acts most people have never heard of. But Leon Russell was a superstar, albeit for a very brief time. He rose from obscurity, after hiding in plain sight for years before that, to become one of the biggest stars in the land based on a weird amalgamation of image and talent, and those who lived through the era will never forget him, COULD NEVER FORGET HIM! It was all about "Delta Lady." On the second Joe Cocker LP, someone also strangely gone, despite his rendition of that Beatles tune eclipsing the fame of the original, I mean come on, when was the last time you heard "With A Little Help From My Friends" if you weren't at a Ringo SHOW! Of course I'm overstating my case, and that's the problem with rock aficionados, they're nitpickers, they want to set you straight to make themselves feel good, but don't criticize them, they lived through an era when music was a treasure hunt, when it expanded from 45s to LPs and you read the credits and combed the bins trying to discover who these people were and oftentimes the only way to hear the music was to buy it and when you did ... it was like opening a Dead Sea Scroll, breaking the shrinkwrap, dropping the needle on something that got no airplay but meant everything to you. Hell, you'd seek out out-of-print records at swaps and cut-out bins, and when you got your hands on them you were thrilled. And when I got my hands on Leon Russell's Shelter debut, which I bought in a shop in a mall in Bridgeport, Connecticut, anchored by Sears which is now a community college, I got home and dropped the needle and was WOWED! It was like I was the only person in the universe who had heard this music, and I wanted to tell EVERYBODY! That 1970 LP opened with "A Song For You," but this was eons before covers made it a staple. Funny how your compositions can eclipse your recorded fame. Then again, musical styles come and go, but a great tune can be reworked and reused forever, it touched souls then and it touches souls now and back then "A Song For You" was just the opening track, not iconic, I wouldn't even put it at the top in quality, I bought the album to hear Leon's version of "Delta Lady." Now back to that Joe Cocker LP. The track that got all the airplay at first was "She Came In Through The Bathroom Window." This was BEFORE "Abbey Road." It was a special curio we had no idea was supposed to be heard in the context of a suite. And the iteration of "Darling Be Home Soon" nearly eclipses the Lovin' Spoonful original. But the song that ultimately prevailed on FM radio, which was gaining steam in the New York market, singles were being left in the dust, was "Delta Lady." "Oh you're mine, yes, you're mine, Delta Lady." Leon's is the same song yet different, it's got a swagger, it's a Hollywood production number that could have been featured on one of those variety programs that still dominated the television airwaves. Leon's vocal was as rough and unique and almost as good as Joe's, and this is rarely the case, the writer's take is oftentimes a poor imitation. Imagine this, dropping the needle on the record of someone unknown and being BLOWN AWAY! And the funny thing about this slightly slower "Delta Lady" is that it had everything, INCLUDING THE KITCHEN SINK, in the production. It was like they went out on Sunset Boulevard and recruited every member of the AF of M to come in and add magic, levitate the building. That's right, coming out of the speakers was a sound so mellifluous it made you want to crawl into your stereo and join the musical circus. Which we did, the Beatles get deserved accolades, but there were second and third waves. The second was Cream and Jimi Hendrix from the U.K., but then L.A. took over, it was where it was happening, everybody who'd paid their dues suddenly emerged intact to dominate. But "Delta Lady" was not the only killer on the solo debut. (That's right, Leon had made music with Marc Benno that had lived in obscurity as the Asylum Choir but it resurfaced after Leon broke through.) I actually preferred the second cut on the album, "Dixie Lullaby" to the opener, "A Song For You." It swung, this was not a developing artist, he was FULLY-FORMED! And you've got to hear "Shoot Out On The Plantation" and "Hummingbird," but the tour-de-force is the album's closer, "Roll Away The Stone." What will they do in two thousand years"
Probably not listen to Leon Russell records, never mind the Beatles, but the essence of music, the way it infects you in this track, that will remain. And all because of credits on the back of the "Joe Cocker!" album. Leon Russell wrote "Delta Lady" and co-produced it and I followed this information down the rabbit hole into a world of happiness. And then came "Mad Dogs & Englishmen." I saw it. At the Capitol Theatre in Port Chester, New York. There was a bit of advance word, but nothing could prepare you for this extravaganza of twenty-odd players and singers who came to town to overwhelm you and leave you talking about it for months afterward, until the double live album came out and everybody got the message. And the majordomo was the silver-haired devil himself, Joe Cocker was barely more than a bit player, the star was the guy in the top hat, Leon Russell. And it ruined Joe's career, he lost control, he drank too much, it would be years before he righted the ship, but suddenly, Leon Russell was a SUPERSTAR! Imagine that. New bands play Coachella and despite press no one reads they never break through. This guy goes on a tour long before the information age takes hold and he emerges a household name! And then came "Leon Russell And The Shelter People." It was all about "Stranger In A Strange Land." It was like this sound emerged from a swamp and you couldn't help but wade in and be sucked down. Long before musicians sold out, when the music was enough, Leon Russell held the hearts and minds of a generation in his hand, he was a leader who infected them with his self-created sound and they couldn't get enough. And one of my favorite memories occurred decades later, in a hotel room with Tommy Nast long after midnight during one of those ubiquitous radio conferences which no longer exist wherein Mr. Nast proceeded to recite the entire rap which ends "Stranger In A Stranger Land" word for word, that was the power of music, we needed to know it by HEART! And now Leon Russell is surfing the zeitgeist, when being a musician is the apotheosis, no one wanted to be President, they just wanted to get on the bus, work in the studio, sell records in a shop, they just needed to get CLOSER! And the third solo album began with "Tight Rope," another composition that has sustained. But the best track is probably the follow-up, "Out In The Woods." Yet my favorite song is "If The Shoe Fits." We like the songs, but we hate to pay"
I swear to god, I'm walking into Watkins Glen with the ticket I purchased and as the guard is saying it's now a free concert "If The Shoe Fits" comes over the PA, HONESTLY! And then Leon pushed it over the limit with his triple-disc concert album "Leon Live" which I actually bought and barely listened to, went country, got married, seemed to lose the plot and was forgotten, almost that fast. Your hold on fame is very tenuous. But talent is forever. I could go back to the studio years. Talk about playing on "This Diamond Ring" and helping compose "She's Just My Style," one of the few Beach Boys-inspired tracks that actually works, I can write about the beginning of the live years with Delaney & Bonnie, I can take you from there to here but when someone dies it's not about informing those out of the loop but reminding those who were actually there how special the work of the person was, and Leon Russell's was certainly special. We didn't expect these players to outlive us, but we did think they'd ride with us until the end, say goodbye and get off the train at a similar time. I mean once you've escaped the drug years, once you've made it past fifty, you're supposed to still hang around, right? I don't expect anybody under the age of thirty to know what I'm talking about, they think a star is someone who self-promotes online and gets paid, they don't understand it's all about paying dues with the hope of bursting into a supernova, knowing only a few have the juice and the rest have to get out of the way. And if you're under forty you might remember Leon Russell as that guy Elton John made an album with, but other than that you're probably clueless. But if you're a baby boomer, this is someone you knew, whose music was in the air, someone who rode shotgun with your life that will soon come to an end also. And just about everything that was important to us will be forgotten. It's already being forgotten. You get a few hosannas in the media when these personages go, but after new tweets replace the old, when the news cycle moves on, there's rarely another word. Leon Russell's story is an American one. How someone from nowhere, godforsaken Oklahoma, can end up dominating the culture, our entire nation, based on talent and hard work, whew! Leon's story is one of a bygone era, when music told you which way the wind blew, when you couldn't wait to go on a journey with your heroes, the most famous and oftentimes richest people in the land. I don't know who goes next. Who walks the plank and is gone forever. I fear the leavings will become de rigueur, they will be seen as the way of the world, the passing of the baton to a younger generation. But that would be missing the point. And the point is for a period of years, now gone, music dominated the world, it was the culture. And it made more money than movies, music built Time Warner Cable. And just like Warner Music was cast off by the conglomerate today music is a second class citizen. MTV made it about fame, about looks and dancing, the penumbra as opposed to the nougat. And then the internet blew a hole in not only the compensation paradigm, but the ability to dominate. And what once was, is now gone. That's right, boomers lived through a golden musical era. They were late to the digital age, many have not caught up. Good times are still ahead, but they're very different from the times we had. When you were addicted to the radio, when you heard something and didn't stop there, but dug deeper and found jewels, when you went to clubs and theatres to see acts so innovative you wondered if they came from Mars. Leon Russell was one of those people. He gave us shelter. He provided asylum in a confusing world. I have no idea who's giving us shelter from Donald Trump, but I do know Leon and the rest of the free thinkers showed us the world was not run by Richard Nixon. Or do I only know how to make you cry"
Today I'm crying, but Leon you did make me laugh, with the joy of being alive, of hearing a great tune, of being exposed to exquisite musicianship, you made me feel like I belonged, that I was not a stranger in a strange land. And for that I thank you. RIP Leon Russell - here we go - into another potentially rough end-of-year. You mentioned in today's FH the passing of Leon Russell. One of the earlier records by him that I immediately thought of was one he made in 1960. Said record also made our local top 40 radio station's weekly survey. It was an instrumental called CREEPIN'. He was credited as writer on the record under his name of Russell Bridges. The tune was credited to a group known as the Starlighters. Flip was a tune called HOT LICKS. Leon Russell still speaks for himself.